Excellent hotel. I have no hesitation in recommending this hotel. Charming, pleasant, helpful and efficient staff. There was a wide selection of good quality food. A beautiful location right on the foreshore. A modern clean well run hotel only lacking Wi-Fi in the rooms or some reason. If you want to spend your holiday lying by the pool and eating good food this is for you. You could of course have romantic, evening drinks on the balcony, look out to sea and listen to the waves. 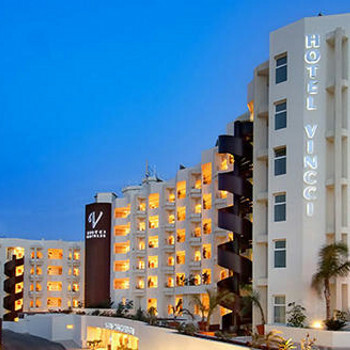 We stayed in the Vincci Golf in June 2009 in it's quiet season, which was just perfect. As the hotel was not full, we never struggled to find a sunbed, and every day but one managed to get the double sun loungers on the top terrace looking out over the ocean! Our room (although only one of the more standard twin rooms) was perfect. It was clean, stylish and just the right size for the two of us. It had it's own balcony, mini bar, television and safe too. The food was perfectly fine, nothing outstanding, but always hot and with a decent choice, however the drinks were very expensive and the staff seemed slightly reluctant to let us pay for them as we went along (no doubt wanting us to put it on a tab, forget how much we've spent and rack up a big bill for the end of the week!) We did find though, that a glass of sangria and large local beer was a reasonably priced round, which kept us happy throught the week! We didn't stay in the hotel at night for any entertainment, but heard kareoke coming from the disco one night! It didnt seem as if there was much going on, but we weren't really looking for that so it didnt matter. All in all, it was a wonderful holiday, and i would definatly consider going back there again. If you go out of season, it's really quiet and perfect for a relaxing and luxury getaway for a really good price! I've looked at some of the other reviews on this hotel and I'd like to point out that anything prior to 2007 is well out of date. This hotel has recently been refubished, in fact when we arrived between Xmas 2006 and the New Year, the hotel had only just reopened - everything was brand new. Apart from a few teething problems - lift doors not closing without a push, showers overflowing into the bath, no sunbeds on the first couple of days, No Gym equipment etc. we found the hotel absolutely wonderful. There were a small number of British holiday makers and the whole place had a really nice homely feeling. The staff were very welcoming and, despite problems with the new computer system, still went out of their way to make us feel important. Nothing was too much trouble. This was especially true on New Years Eve, where we were treated to one of the best parties I've ever been to in a hotel. Food quality was superb and my only negative comment would be that there was not much variety on offer. Rooms were cleaned every day and were furnished with high quality fixtures and fittings. Our room had air-con, two bedrooms and a large lounge which was more than big enough for a family of four. It also had a balcony overlooking the sea which offered fnatastic views. The reception and poolside areas were on two levels and were always kept clean and tidy and were a real suntrap. The hotel even had 'four poster' beds for sunbathing on. Based on my experience of staying in many 4 and 5 star hotels around the world, I'd say that this is definitely a 4 star and I would definitely stay here again should we travel to Tenerife in the future. FOOD unbelievable! sickness and diarrhoea prevailed. The bar staff were lovely the reception and restaurant staff not worth giving the time of day to. The manager refused to speak to us! The drinks stopped at 10pm and the entertainment (2/7 nights only) didn't start till after 11pm! When we arrived we had no bedding and a filthy room! Do not visit this hotel even if they pay you! We stayed at the Hotel Tenerife Golf and after reading the negative reviews were very apprehensive. However, on arrival we were pleasantly surprised. This is certainly no more than a two star Hotel, and it is shabby and the food is pedestrian, but certainly edible. Staff are very good and attentive, and the rooms are very large with sea views. We wanted a cheap, quiet break by the sea and we were not disappointed. There was no entertainment, but we didn't want any....The location is close to the airport, but we rarely heard flights and this was not a problem. Food is cheap, and on several days we ate out very inexepnsively at excellent restauarants nearby. Not a place for children, but fine for a quiet chill out in the sun. This is possibly the worst hotel I have ever stayed in. Do not visit this hotel. We went all inclusive which obvioulsy means you need not worry about buying food or drink, we ate out at every meal as the food was digusting! We even heard that someone sneaked into the kitchen and peed in the food! There was nothing there we even would think of putting in our mouth, most of the time there wasnt even food there! Food - disgusting had to eat out all the time after visiting the restaurant once. The hotel was absoloutely filthy. Rooms were damp as were the beds. First impressions was Bates motel. This hotel is nothing but a joke, do not book. Drinks restricted to 1 per person per visit to the bar. Some bar staff had attitude problem. Chef unnecessary as food from tins mainly. Hot Food; luke warm and looked stale, very repetitive daily. Only meat changed. Fruit juice container and tubing very dusty and looked in need of flushing through. Wine served at dining table warm and of very poor quality. Rooms very spacious, but patio doors did not lock. French door to main bedroom made awful noises due to poor fitting. Maids appeared to do as little as possible and were noisy, shouting to one another at times. Informed by rep. that 3 star rating due to amount of complaints re: food. But we dispute even a 2 star rating! Very poor over all. If not for sunshine would have been very upset. Soiled towels left for changing were replaced on towel rail. Entertainment started at 10.15p.m! and was very poor. No umbrellas at poolside. Sun beds in need of repair and cleaning! Attractive looking hotel set on the coastline - no beach. Reception area very good. Pool area not very clean, sunbed pads never collected at the end of each day or cleaned whilst we were there. Rooms very spaceous, seaview with large balcony and standard size fridge, but only complaint is that the cleaning is not up to standard. Our glass balcony doors had smears, handprints & dust on when we arrived - still there when we left. Floors and furniture dusty. Enjoyed our holiday, but felt there was no attention to detail. Complex opposite with variety of bars, shops & restaurants. A visit to a small fish restaurant in San Blas overlooking harbour advised - excellent. Hotel was generally clean and rooms were much larger than expected and well equiped. Pool area in need of refurbishment as quite tatty, pool side snack bar dirty and never open. It is so windy around the pool that it is literally impossible to sit outside without towels, books, sunlounger etc etc blowing away. Hotel food was extremely poor and the choice limited, we were half board but ate out almost every night. Wine at the hotel is the worst we've ever tasted!